So I've been shopping around for bookshelf speakers recently and noticed these in my inbox earlier. Well branded ones at around this wattage are typically at around the £100 mark and up, so thought this was a really nice price. The expected shipping date of this product is 21/09/15. As soon as the order has been dispatched you will receive an email containing Track & Trace information to track the shipment. Those looking for a set of compact speakers that deliver huge sound have come to the right place. These SC-M39 speakers are less than 24 centimeters high and deep, and fit perfectly on the bookshelf, but despite their modest size they provide full, deep sound in both the high and low frequencies. 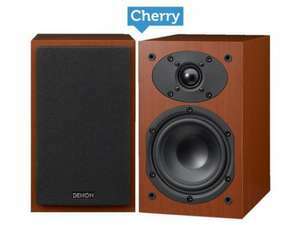 The speakers have been designed with Denon Hi-Fi craftsmanship and European Sound engineering. For best performance a high quality 12 cm woofer / midrange chassis has been combined with a high definition tweeter with ventilation hole and a crossover network with selected components to reproduce the smoothness of natural sound. 5/5 on What HiFi, but take in mind that's with the Denon amp as well. I've got an Acoustic Energy Aego M, used it for well over 7 years now. Is that amp powerful enough to power these bookshelves or would I need another amp? I've got an Acoustic Energy Aego M, used it for well over 7 years now.Is … I've got an Acoustic Energy Aego M, used it for well over 7 years now.Is that amp powerful enough to power these bookshelves or would I need another amp? Yep, it'll do the job just fine. £39.95 showing for me. Also 4% quidco. Thanks just ordered a pair. Not that their website looks a bit dodgy, but at this price should I … Not that their website looks a bit dodgy, but at this price should I expect cancelled order due to "out of stock" or other excuse and endless spam emails once my details are in their database? [/qu[quote=BenderRodriguez]Not that their website looks a bit dodgy, but at this price should I expect cancelled order due to "out of stock" or other excuse and endless spam emails once my details are in their database? You can use paypal at checkout. Whenever I see that I can't help but swap the b for a p. I know it's childish. When I was buying a DM39 unit I demoed these along with some wharfedales and some ageing missions I had in the cupboard and the missions and wharfedales blew these out of the water. Nice find OP. I'm just struggling to find an excuse to get a pair. Heat added. now £39.99 excellent price... just wish they had black left. A pity there are no cheap DM39s left, and postage is a bit uppety. Please don't do this to me OP. I already have some JPW monitors, and some brand new TEAC speakers (similar to these) that are collecting dust. I don't need these lol. I just bought Dali Zensor 1's with a DM - 40.